Another new label to add to the list. Mon Tout is the small-batch project of Richard Burch, youngest son of Howard Park owners Jeff & Amy Burch. While Richard spends his days as the family’s sales driver on the Australian eastern seaboard, this label is very much a personal obsession. Hence mon tout (my everything). All of the Mon Tout wines are sourced from vineyards farmed biodynamically and made with minimal additives. 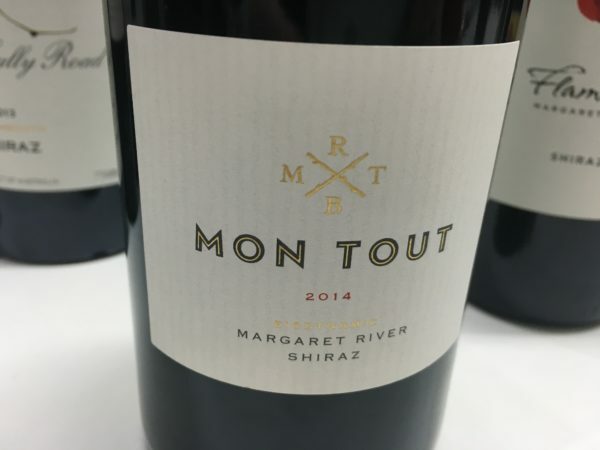 This Mon Tout Shiraz 2014 comes from a biodynamic vineyard in Wilyabrup. Handpicked, it was wild fermented and matured for 9 months in a mix of old and new oak. I’m not strictly a Margaret River Shiraz fan (the one region where Merlot outperforms Shiraz), but this is sultry. Red purple coloured, this lobs up with black pepper, roast beef and a whiff of dandelion. Even and well balanced, the palate has delicacy in a northern Rhone-esque form, without the uneven ripeness that dogs Margs Shiraz. Effortless tannins and gentle acidity also really attractive. Blind, I would have picked this as modern Canberra Shiraz, not from Margaret River. Clever, medium weight Shiraz, delivering without sacrificing power. Best drinking: 2016-2028. 18/20, 93/100. 13.5%, $35. Would I buy it? I’d drink a bottle. Price is fair as well. Out of interest Andrew, have you ever tried some of the Churchview wines from over there in west oz. They make quite a selection, including a stunning wild fermented Riesling coming in at 8 per cent. But you wouldn’t know it! Keep up the great writing. I’ve had a few Churchview wines over the years. Some good value under the label, true.